Can’t get enough of them. Seriously. There’s something about seeing all that fresh produce out on display that gets my heart pumping. I’m not even sure why. It’s all organic (naturally), which means, the apples have bruises, the pears are splotchy, and the carrots sometimes resemble the gnarled, warty fingers of witches. (Happy Halloween, by the way). If I want pretty-looking produce – perfectly round and shiny fruit, all lined up in neat rows – I’ll go to the grocery store. But like supermodels, there is such a thing as being too good-looking. I like my fruits and vegetables to have flaws. Those waxy-sheened apples in Safeway remind me of actors who have gone in for a little cosmetic surgery. Their flesh would never be that smooth and supple otherwise. I think the biggest draw is that everything there is locally grown – I’m a firm believer in helping to support the local economy, which is why I only buy Tillamook cheese even though it’s more expensive than, say, Kraft – and fresh. Chances are, that tomato you are buying at the farmer’s market today was still attached to a vine yesterday. Everything is picked at the peak of flavor, and tastes about a thousand times better. Plus, there’s more to farmer’s markets than just fruits ‘n veggies. There are stands selling a variety of hot foods and coffee. My local farmer’s market has a booth featuring miniature hot doughnuts that are, seriously, to die for. OK, not seriously seriously. But they’re really good. You can often find arts and crafts, and entertainment. Farmer’s markets aren’t a side trip or a detour – they are a destination. 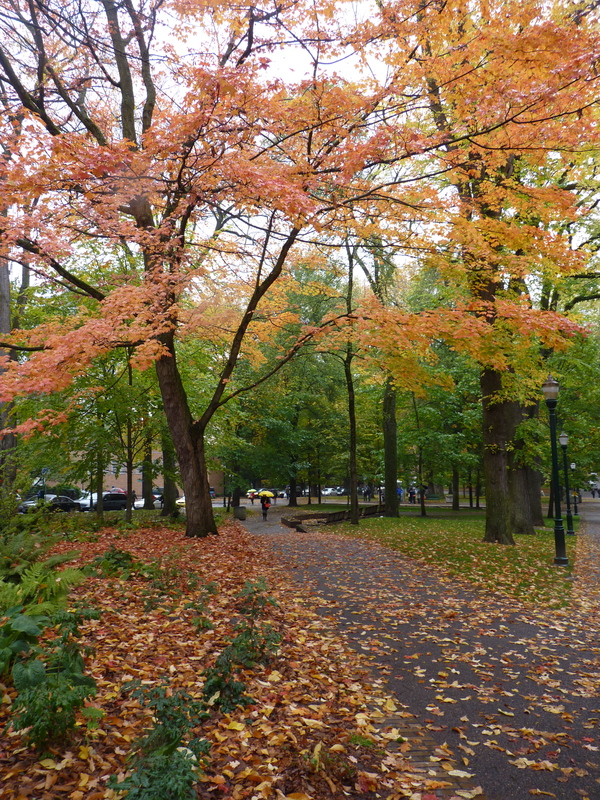 The South Park Blocks showing off their autumn colors. 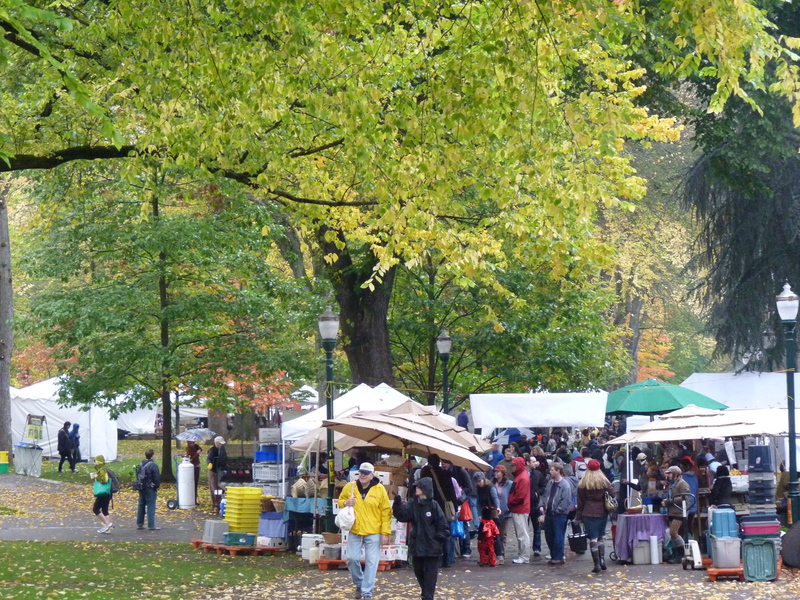 Which is why, although yesterday was the epitome of a dreary autumn day – rainy, foggy, and chilly – I drove into Portland to pay a visit to the downtown farmer’s market in the South Park Blocks at PSU. I’d spent enough time sitting around the house last week (when I wasn’t shuttling kids back and forth, that is), and was more than a little anxious to get outside and do something. I’d heard that the market in autumn – and especially right around Halloween – was a unique experience. Their website was advertising a Great Pumpkin Event and live entertainment from a band called 3 Leg Torso. I don’t know which was the bigger draw, the pumpkin-carving contest or the crazily-named band, but I headed down there to check out both. 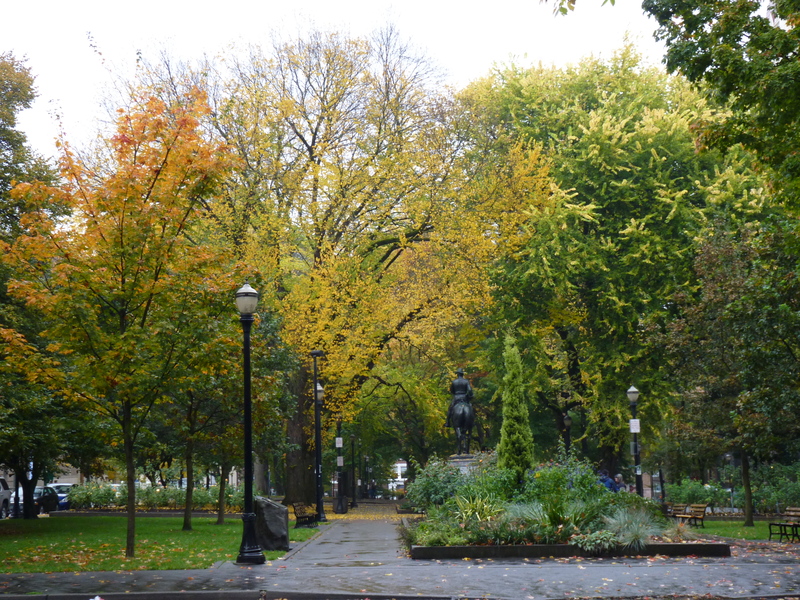 When I arrived in the South Park Blocks – a beautiful urban oasis in the heart of downtown Portland – I found that the abundant trees were in full-on fall foliage mode. Lots of yellow leaves, some reds, and great piles of newly-fallen leaves carpeting the ground. A steady rain was falling, leaves were swirling to the ground, and the whole scene looked like something out of a Norman Rockwell painting. Picture perfect. I donned my newly-acquired “dad jacket” to ward off the wet chill, and walked to the market. Who wouldn’t want to walk this path, rain be damned? I have to admit, I was unduly harsh on this jacket, because you know what? It kept me perfectly warm and toasty, and it’s also totally water-repellent – the rain would bead up on the jacket (kind of like water droplets on a freshly-waxed car) and then drip harmlessly to the ground, leaving the jacket itself oddly dry. Could the Tony Hawk have done that? Oh, I doubt it! Guess I made the smart purchase, after all. The market was a bustle of activity, and filled with colorful fall produce. Lots of pumpkins and squash. Multitudes of apples and pears. Carrots, potatoes, and kale. Earthy mushrooms. There was even a woman roasting chestnuts over an open fire (which, regretfully, I did not try – I’ve never had a roasted chestnut before; but now I have an excuse to come back closer to Christmastime). 3 Leg Torso was rockin’ out on stage, kids and adults were carving pumpkins beneath a tent, and the air was filled with the competing scents of hot coffee, bubbling soup, and grilled sausages. I bought some apples and pears and a container of soup to make at home (because the free sample was out-of-this-world delicious, although I have a feeling that may have been because the weather was cold and wet and that little cup of hot soup hit the spot like nobody’s business). It was lunchtime, and I was hungry, so I got an artichoke and cojita cheese tamale from Salvador Molly’s booth. I’d always wanted to try their food, because Adam Richman took on their “Great Balls Of Fire” spicy fritters challenge when Man V. Food visited Portland last year, and let’s face it, Adam is awesome. I ducked beneath one of the PSU buildings to dodge the rain and dove into my tamale, which turned out to be – hands down – the best tamale I have ever eaten. Oh man, it was good. 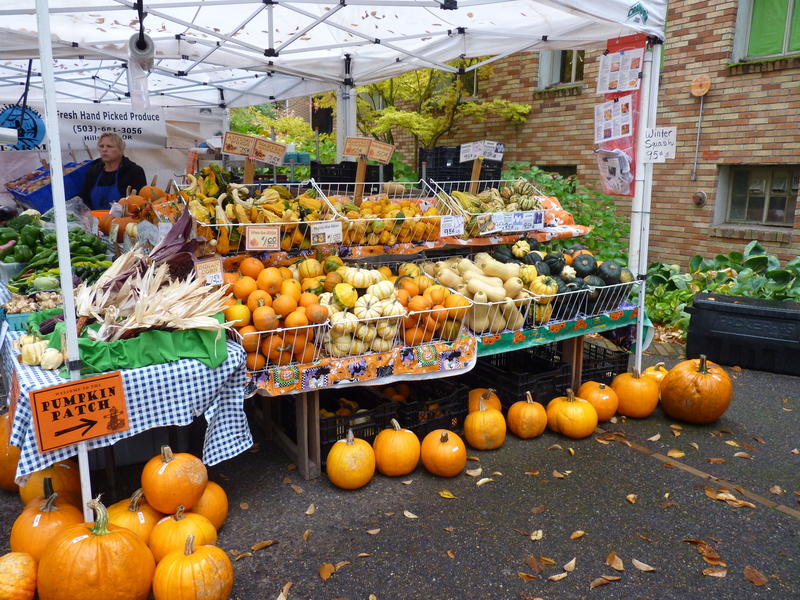 This is what the Portland Farmer’s Market looks like right before Halloween. A friend of mine, upon learning of my fondness for farmer’s markets, challenged me once to pick up all the ingredients for dinner there sometime. I could only eat food that I had purchased at the farmer’s market that day. I loved the idea, and decided on a whim to go ahead and meet this challenge head-on yesterday. Fortunately, there are several vendors who sell locally-raised meats, so it wasn’t too difficult to come up with a plan. I chose a farm-raised New York strip steak first, and worked around that. Dinner last night? I started with an appetizer of sliced red pear and havarti cheese with chives. The main course was the aforementioned steak (grilled to medium-rare perfection), topped with sauteed chanterelle mushrooms, and a side of roasted rainbow-colored fingerling potatoes. Everything purchased from the market hours before. It was a fresh and delicious meal. After the market, I walked around Portland for a bit. It’s such a friendly, funky, and eminently walkable city. Growing up, my dad was in the Air Force, and we moved around all the time, so I never had anyplace to call “home.” I’ve lived in the Portland area for almost 16 years now (next month marks that anniversary), far longer than I’ve ever resided anyplace else in my life. Without a doubt, Portland is home. All too soon, it was time to come “home” home. On the drive back, I thought to myself, I definitely want more days like the one I’d just had. A little rain never deters true Portlanders. But the real question is…did you eat it w/a spork??? Ha! Now, why didn’t I think of that? Hmm… Not sure I can keep reading this is you’re going to talk about amazing food, amazing foliage and amazing community food challenges! 🙂 Your meal sounds sooooo good. Although I’m happy without the rain and cold, the season-less place does make me miss the wonders of, well, pretty much everything you described. I shopped almost exclusively for fresh produce from the farmers’ markets in SF before I came here, and I gotta say that it’s been harder to withdraw from than good espresso! I tried to get something new every few weeks, like these darling Korean melons or an herb that a Vietnamese vendor didn’t know the name of. My kind of fun! As you can imagine having lived in Hawai’i, fresh produce has too many miles on it to be spectacular, but I’m slowly discovering outlets of local produce. My bf’s coworker has been bringing us guavas from his tree, for example. Win! And I have herbs on the lanai, slowly sucking up the tropical heat. I do really miss CHEESE though. We’ve been enjoying Tillamook of course (carbon footprint be damned) but what I wouldn’t do for some runny French stuff… Anyway, enjoy your bounty and remember that things are still interesting there in the dead of winter. You’d be surprised at how much inspiration you can draw from kale, rutabega, beans, etc! I’m not a big baseball fan, so I’ll hop on your bandwagon. Go, Giants! Do you have papaya and passionfruit in Guam? Those are two things I remember best from Hawaii. We used to go hiking and collect passionfruit that had fallen to the ground. When we got home, my mom would make passionfruit cookies that were indescribably delicious. Only in Paradise, I suppose! There are papaya trees everywhere and I see a lot with fruit, but few with ripe fruit, so not sure if those get picked or what. I should drive around less populated areas… with a ladder. I haven’t seen passionfruit yet, but I love any kind of tropical fruit, so I’ve got my eyes open for sure! When I do, I’ll hit you up for the cookie recipe. Mmmmm. I love this. There’s a special place in my heart for farmer’s markets and fall foliage. This post hits just the right spot. It’s weird to think that you are midway through Spring where you live, and Summer is right around the corner! The farmer’s market separates me from my money faster than any other store can…. We love farmer’s markets too Mark, and it’s nice to finally call Portland “home”.